One of the things I continually hear from colleagues in educational development is that we struggle to say “no” to the ever-increasing demands that we face in our roles. In order to help us establish our key priorities and goals for 2014, our educational development unit recently embarked on a strategic planning process to help us address this very dilemma. 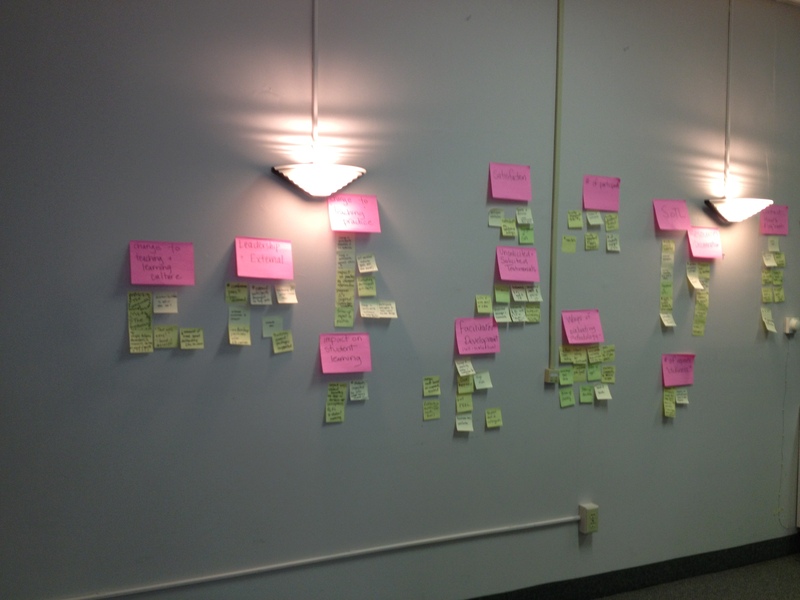 During a one-day retreat, we used the following 4-step process to help us define our key priorities for 2014. Step 1: What metrics do we use to evaluate our success? During this first step we defined and prioritized the metrics that we use to evaluate our success. We first individually brainstormed the qualitative and quantitative methods that we use to evaluate our success as a unit. Guiding question: What metrics (qualitative & quantitative) should we use to evaluate our success as a unit? 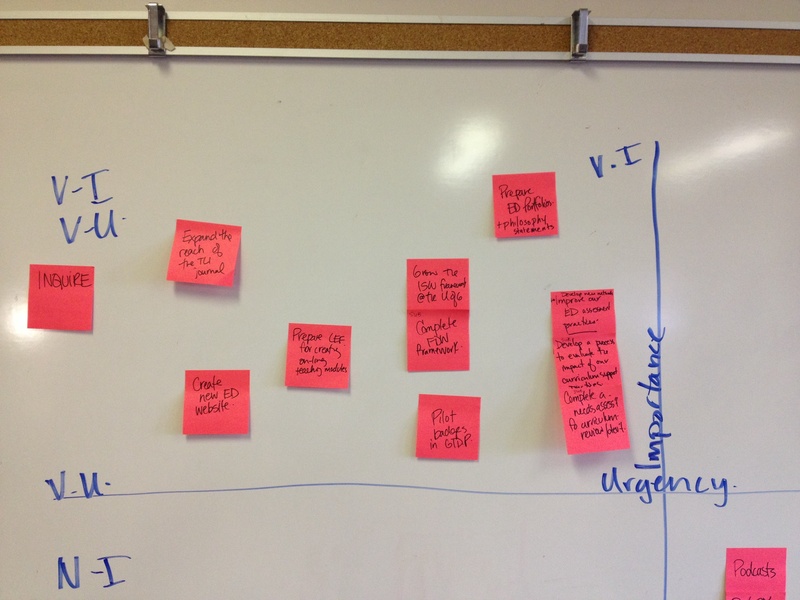 After clustering and summarizing the key metrics we used a 2 x 2 matrix (Effort: easy/hard vs. Impact: high/low) to rank these metrics in terms of being able to evidence and communicate our impact. Guiding question: How would we prioritize these metrics in terms of being able to evidence and communicate our impact? Step 2: What key strategic directions should guide our practice? Our next key step was to discuss how current strategic institutional, unit and educational development approaches align with our practice. Here, we discussed our current mandate and practices, 2013 integrated planning goals, institutional strategic directions (e.g. as communicated in the University of Guelph’s Strategic Mandate Agreement and Integrated Plan), as well as some broader strategic approaches affecting educational development practices. Guiding questions: Which strategic institutional, unit and educational development approaches should most inform our ED practices for 2014? Where are the gaps? Where should we focus? What are our top 3-5 strategic areas of focus? Using evidence-based approaches, the ED unit supports educators and provides expertise to enhance pedagogical practices at the University of Guelph. Promoting highly effective learning opportunities that foster deep learning and student engagement. Embedding internationalism throughout the curricula (e.g. 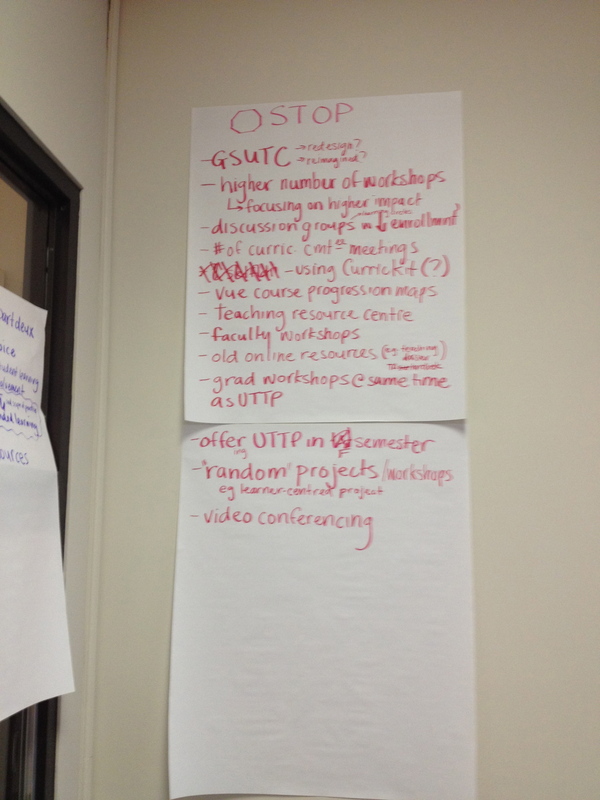 learning outcomes, courses, and programs). Supporting Community Engaged Scholarship and Community Engaged Teaching and Learning. Step 3: What should we start, stop (or do more efficiently), and continue doing? Our third step in the afternoon involved evaluating and establishing our key priorities and goals for 2014. To do this, we first reflected back on the outcomes of the previous 2 steps and engaged in a process familiar to educational developers – a start, stop, continue exercise. Not surprisingly, the most challenging area for discussion was what we should “stop” doing. However, we found that we could negotiate this challenge by expanding our frame of discussion to what we should stop and/or do more efficiently. During this step it was extremely important to maintain an open frame of mind to ensure there was a free flow of creative thought amongst team members. This is a key step to the process and it is critical to ensure that all ideas generated are recorded without judgement or censorship. Guiding Question: Based on these strategic approaches and the metrics we will use to evaluate our success, what should we start, stop (or do more efficiently) and continue doing as an ED Unit? 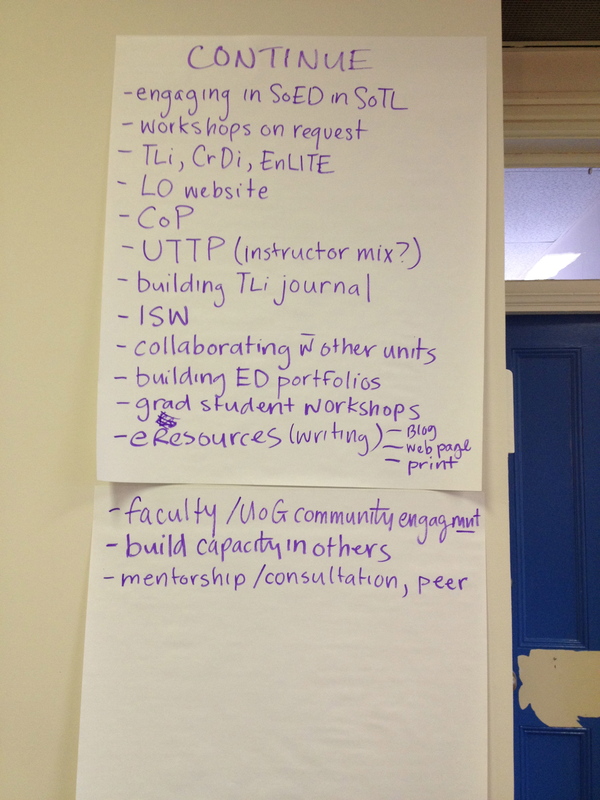 Step 4: What are our key ED unit goals for 2014? The final step in the process was to define our goals for 2014, while taking into consideration to outcomes of the three previous steps. This collaborative process flowed naturally from the previous discussions that had occurred during the day. Guiding Question: What specific and measurable goals would we like to achieve as a unit for 2014? 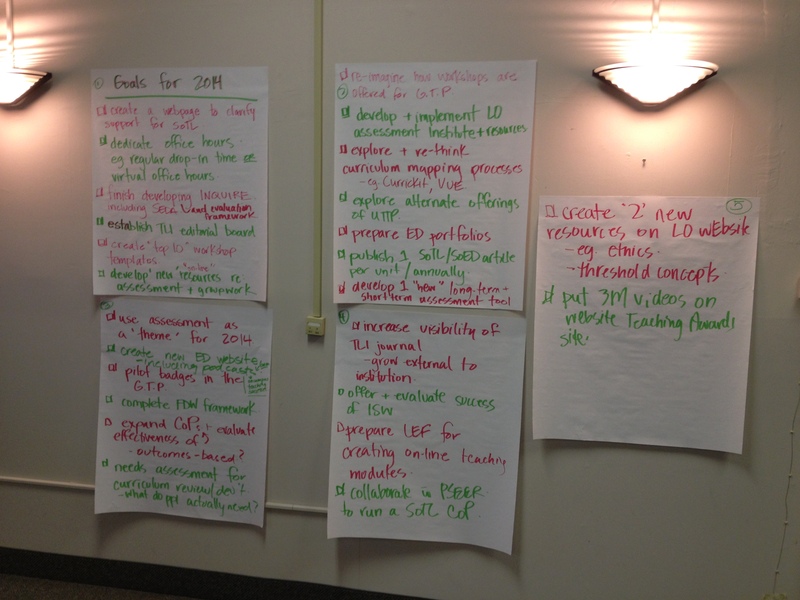 During this next step our unit was able to successfully define our key goals and priorities for the 2014. One additional step that will help to provide focus is to now take these goals and further prioritize them using a 2 x 2 matrix (importance vs urgency). This would help us to define our highest priority tasks (High Importance, High Urgency), and where we should be spending our most time (High Importance, Low Urgency). After a much deserved holiday break, our unit DID come together to prioritize our goals based on the above noted Importance vs Urgency Matrix. The results helped us to clearly define our high priority goals (high importance, high urgency), as well as where we should be spending most of our time (high importance, low urgency). 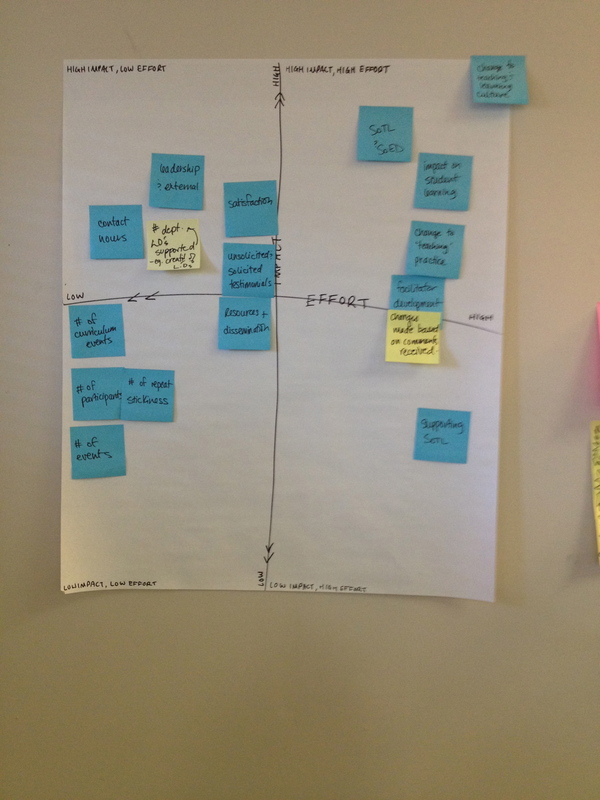 We were also able to simplify our goals, removing any that fell into the quadrants of low importance. In the end, we removed 6 of our 25 previously defined goals, leaving us with 19 annual goals upon which to focus our practices as a team. As and added benefit, the process of coming back to these goals after 2 weeks provided us with an important opportunity to reflect upon and further clarify and refine each of our goals. As we work to align our individual goals with these priorities they will certainly provide a key frame of reference for focusing our time on areas that are certain to have impact on our individual and collective success for 2014 (a.k.a. on things that really matter)! Christensen Hughes, J, & Mighty, J. (2010). A call to action: Barriers to pedagogical innovation and how to overcome them. Taking stock: Research on teaching and learning in higher education, 261-277. Dimitrov, N., Meadows, K., Kustra, E., Ackerson, T., Prada, L., Baker, N., Potter, M.K. (2013). 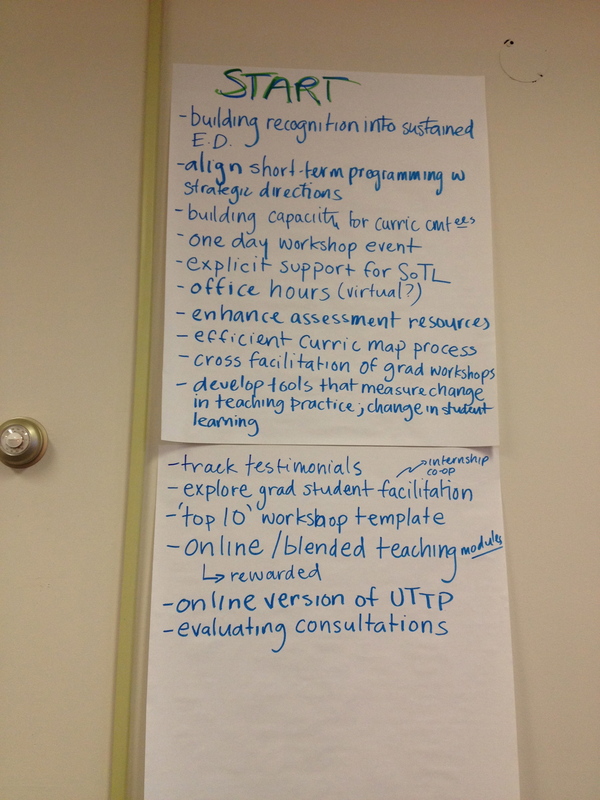 Assessing Graduate Teaching Development Programs for Impact on Future Faculty. Toronto: Higher Education Quality Council of Ontario. Felten, P., Bagg, J., Bumbry, M., Hill, J., Hornsby, K., Pratt, M., & Weller, S. (2013). A call for expanding inclusive student engagement in SoTL. Teaching and Learning Inquiry: The ISSOTL Journal, 1(2), 63-74. Hubball, Harry, Pearson, Marion L, & Clarke, Anthony. (2013). SoTL Inquiry in Broader Curricular and Institutional Contexts: Theoretical Underpinnings and Emerging Trends. Teaching and Learning Inquiry: The ISSOTL Journal, 1(1), 41-57. Gibbs, G., & Coffey, M. (2004). The impact of training of university teachers on their teaching skills, their approach to teaching and the approach to learning of their students. Active learning in higher education, 5(1), 87-100. Grabove, V., Kustra, E., Lopes, V., Potter, M.K., Wiggers, R., & Woodhouse, R. (2012). Teaching and Learning Centres: Their Evolving Role Within Ontario Colleges and Universities. Toronto: Higher Education Quality Council of Ontario. Trigwell, Keith, Caballero Rodriguez, Katia, & Han, Feifei. (2012). Assessing the impact of a university teaching development programme. Assessment & Evaluation in Higher Education, 37(4), 499-511. Hi Natasha. After reading your post the steps you have gone through can be really helpful for any sector – not just Education Development. As a sector I work in for strategic development, the steps show a priority and analysis for objectives. Similar to the SMART matrix. Great article! Thanks!